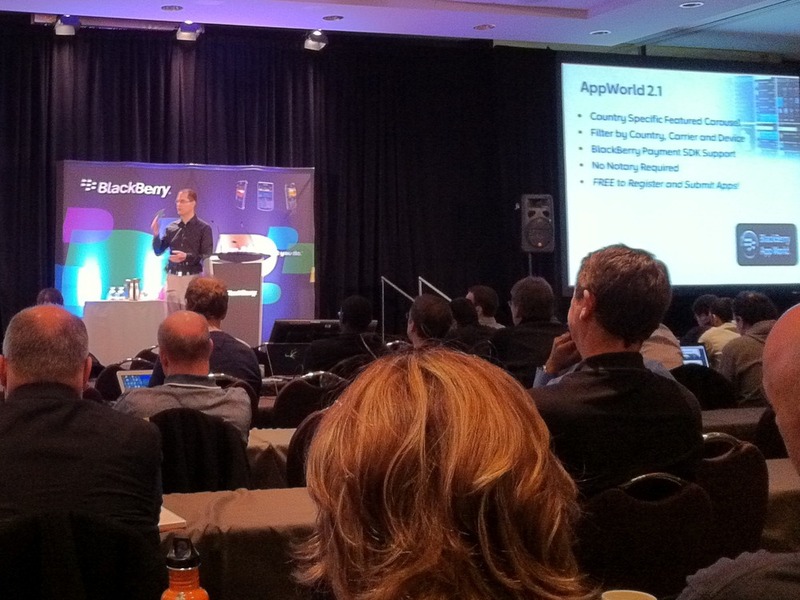 I was in attendance at the BlackBerry Dev Day in Toronto a few days back (31st March 2011). I was mostly interested in finding out more about the BlackBerry PlayBook from a developer’s perspective as I’ve been developing an app for it recently. Here are some notes I made regarding the PlayBook during the talk as well as a video of a live demonstration of the PlayBook’s prowess. ‘Gold’ version of the PlayBook SDK will be released very close to the launch (19th April) and it will have substantially more new features. This makes sense, as the current SDK available to developers lacks some of the functionality that I occassionally see in offical PlayBook demo videos (e.g. 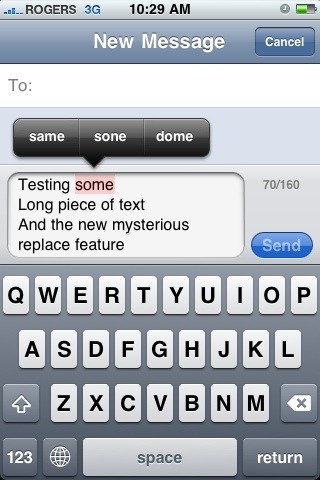 the markers at the start and end of text selection) suggesting that they are holding some features back from developers until they are ready to release it (or run out of time and have to release it as is). Ad Services and Payment Services for PlayBook developers will not be available for at launch in the SDKs, but will be added soon after. Payment Service will be there by summer. Similarly, the Analytics service will be made available on the PlayBook some time after its launch. The service will work through WebTrends. This sounded like a very intrusive service for the users, but potentially great for the application developers. If the developer includes this service in the app, it can be switched on by default (without asking user’s permission) if the developer chooses to do so. The service will send data to WebTrends servers. The only way the user can switch this off is by setting the firewall settings on their device to block www.webtrends.com (not very user friendly). Later they said that the user will be notified through the app that the app is trying to connect to WebTrends and they can choose to block it from there, which is slightly more user friendly. However I’m not sure if they meant if the user will be specifically told that the app is trying to connect to WebTrends, or if the app is asking for general internet connectivity permission. Overall, there was a bit of conflicting information regarding this, and it sounded like a bit of a work in progress – I suspect they will modify things to make it easier for the user to manage this before officially making this service available. There is no support for virtual currencies right now, but they are trying to implement it – as soon as they figure out how to deal with some unique accounting issues related to that. All PlayBook apps submitted by 31st March, are likely to be reviewed by the 19th April launch date with 90-100% probability. The app review team is well-oiled and getting better at reviewing apps. I have to personally agree with this. Keeping track of app submissions and approval dates in the Developer Forum suggests that the team is operating much faster now than in the beginning. Push doesn’t exist on PlayBook today, but will come later. Native PlayBook clients for email, calendar, etc will come later. At launch these will only be accessible via the BlackBerry Bridge (which works through Bluetooth). BBM is not in the PlayBook except for through BlackBerry Bridge (for now). They suggested that it might be worthwhile to launch apps in non-North American markets first (e.g. Indonesia, Mexico/Spain) to get some feedback and revenue and then launch in the larger North American market. They also said its worthwhile offering translations into other languages (particularly Bahasa and Spanish). Here is a video of RIM’s Director of Developer Relations, Mike KIrkup, demoing the PlayBook to an impressed and applauding crowd. 0:57, when he demonstrates playing an HD video over HDMI with Need for Speed still running in the background (albeit in a paused state). 3:32: running camera and playing Need for Speed at the same time. Need for Speed is controlled by the accelerometer and you can see the camera angles changing in the live thumbnail view as well as the car turning in that direction in the Need for Speed live thumbnail view simultaneously. 5:24: Over The Air (OTA) update mechanism. The device, when first shipped, will ask the users to perform an OTA update before they can start using it. The last few months I had been building an app for the upcoming launch of the BlackBerry PlayBook tablet. Its a fairly simple app – a text editor that syncs notes with Dropbox – and consists of about 3000 lines of source code. Now that I have submitted version 1.0 of my app to the BlackBerry AppWorld, I wanted to take a step back and look at my progress, and more importantly, my productivity. I worked on this during any spare time that I got from my full-time job. I first started during the Christmas/New Year’s holidays. This was the most productive, and also the most frustrating time, since I was learning how to do things on a new platform (Adobe AIR + BlackBerry QNX) for the first time. Also RIM had an offer going on for all developers: if the app was submitted before February 1, and accepted, the developer would win a free PlayBook. So initially I was aiming to finish up in about a month. However, on January 13 I found out that RIM had extended that deadline to March 15. And my productivity suddenly dropped right after. I realized that I didn’t have an excuse for ignoring all the other things in my life that required my attention, so I started dealing with them. 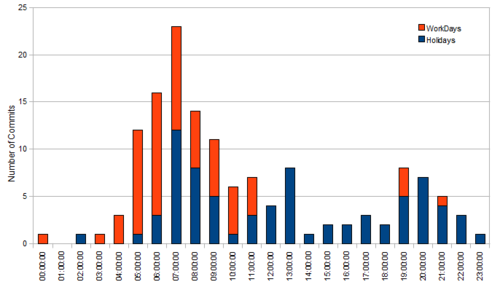 Also, work got a bit busier during early February and I generally found myself having less spare time. Anyhow, my activity started picking up again closer to the next deadline. There was another small drop when I discovered that the second deadline had been extended, but I pulled through this one with a determination to finish by the now defunct second deadline. Eventually, I was able to finish slightly past that deadline, and had my first release ready by 22nd March. Deadlines work. But only when they are enforced by some third-party. Self-imposed deadlines have never been effective for me. Life always gets in the way. There’s just no getting around this one. Momentum is important. It’s hard to get back momentum once you lose it. But once you have it, you’re on a roll and much more productive. Social life gets put on the back burner. Devoting your time between a full-time job, a side-project that feels like another full-time job, and taking care of life’s necessities, really doesn’t leave time for anything else. The chart is divided into working days and holidays (weekends, Christmas break, New Year’s, Family Day, and an extra day off I took on the Wednesday between Christmas and New Year’s). 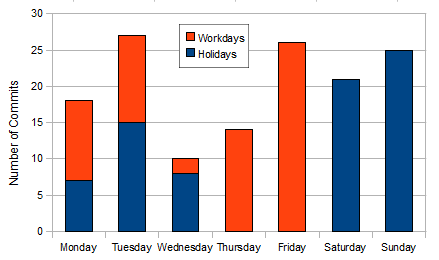 Surprisingly, my two most productive days of the week are not on the weekend, but they are Tuesday and Friday. It looks like 7am is the most productive time of the day for me. There is a reason why I have gravitated towards working in the mornings: there are the least amount of distractions then. Most of the world is asleep and there is little activity on Facebook, Twitter, tech blogs and news websites to distract me. Also, my mind is fresh in the morning and not tired after a full day of work. Luckily, I have a job that is flexible with their work hours, so I was able to shift my working hours to later in the day. Night time was mostly reservered for eating dinner and unwinding by watching a little TV and clicking away at links on sites I frequently visit. 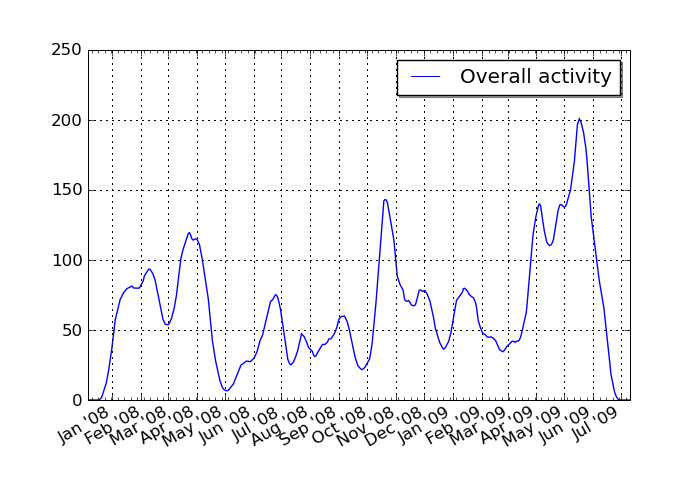 It also looks like I do roughly about the same number of commits on holidays as a do on workdays. Its just that my commits during holidays are spread out more evenly during the day. This makes me wonder if I am more focused and get the same amount of work done, as I would on a full day of a holiday, that I get done in a few hours on a workday. Perhaps I am subconsciously treating the fact that I can’t be too late to get to the office for my job as a ‘deadline’. And that deadline mentality forces me to get more things done faster. Perhaps I’m one of those people who work better under pressure. 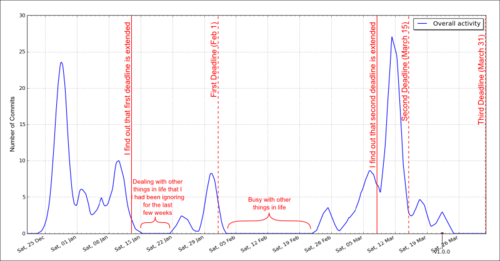 The Mercurial Activity extension lets you measure the number of commits done to a Mercurial repository per day and chart it out using Matplotlib. The installation process was a bit of a doozy on my Windows system, so I wrote this step-by-step guide. The extension uses the Matplotlib library for plotting the chart, so you will need to have that set up inside your Python distribution. The default Python installation I had on my system was v2.7 64-bit, and the default Mercurial client I was using was TortoiseHg (with Mercurial 1.7). However after some tinkering around, I found out that I couldn’t get the extension to work with this sort of setup – mostly because TortoiseHg comes with its own Python distribution in some DLL file inside a library.zip archive and I have no idea how to install a Matplotlib site-package in there. Get Python v2.6 32-bit (I found this to be the lowest common denominator which would work with all of Numpy (a pre-requisite for Matplotlib), Matplotlib, Mercurial and the Activity extension). For all remaining steps, make sure you are using this distribution of Python and not your default one (if it is different than this one). Of course, set the actual path to where ever you extracted activity.py. If you have TortoiseHg installed, you can gain access to the global mercurial settings file by right-clicking in Windows Explorer, selecting TortoiseHg->Global Settings, and press the ‘Edit File’ button. This will create an activity.png file in the current directory. To see all other options available, run ‘hg activity help’. I immediately recognized this as an installer issue since I’ve seen this problem with other softwares. But I was expecting better from a big player like Blackberry. Especially after someone complained about the SDK installer having the same issue a month ago. They did manage to create 64-bit compatible installers for the SDK since I didn’t have any problems installing that. But no one bothered to check the Simulator installer for the same issue. This is not very developer friendly, especially for a company just breaking into the Tablet market and trying to play catch-up with the competition. I don’t understand how companies can casually overlook 64-bit platforms as they represent the future and many developers have already jumped on board. Its understandable if this was for a consumer product and they didn’t want to support 64-bit systems. But this is a product specifically designed for developers. If you’re not making things easy for your target audience, then you’re doing something wrong. and the ISO file that we need will be found sitting there. 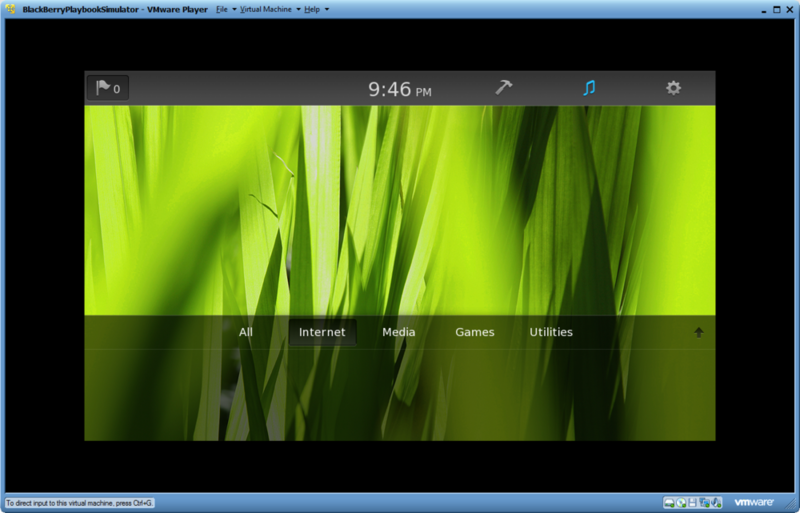 The ISO file is meant to run on VMWare Player. So clearly it has no 32-bit/64-bit architecture issues. Its just the installer that Blackberry couldn’t bother fixing. How stupid is this. Update: As you can see from the image at the top of the post, I was able to finally get the Simulator running. This just confirms that the Simulator indeed works on 64-bit machines. Its just the installer which doesn’t. For the longest time I’ve been wanting to have a personal avatar that I could use for my profile picture with online services. I didn’t feel comfortable putting up a real picture, but on the other hand I wanted to have something more personal than some arbitrary photo/design. So recently, I decided to spend some time and create a vector version of my cartoon-self. Since I am not artistically inclined, I decided to use an existing photo of myself as inspiration. I traced the outline of my face from the photo, and continuously used it for reference for contours, colours and gradients. I tried not to make it too realistic in an effort to avoid the uncanny valley. I find doing such drawings relaxing and it gets the creative juices flowing. I also got to learn a lot about how things work in Inkscape. I particularly love how you can fine tune vector paths to the smallest detail and easily create smooth lines – something I would never be able to do with just my hands using pencil and paper. My python code for extracting all versions of a file from a SVN repository can be found here. Note that you will need to install the pysvn library for your python distribution for this to work. 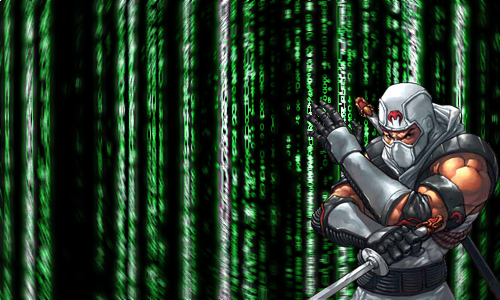 Who is the elusive Ninja Programmer that all the tech companies want to hire? If you’ve been browsing around programming-related websites like StackOverflow, you’ll occasionally see ads for companies looking to hire programmers, and quite often you’ll see them trying to entice you with graphics or mentions of Ninjas, Rockstars or Superheros. But this is not enough to convince me that this is more than a tacky marketing scheme by Human Resources Agents. As programmer Jon argues, there are experienced professionals in other industries too, but they don’t get referred to as Ninja Doctors, or Ninja Lawyers. However programmer Anna points out that this is most likely because the programming culture is closely tied to the gaming sub-culture, whereas the other professions aren’t. However, I still feel that the term is being grossly misused just for its coolness factor. If you ever saw the G.I. Joe cartoon from the 1980s you may remember the character of Storm Shadow. He had a sword and some throwing stars but with just the right sequences of punches and kicks managed to take apart a tank in an episode. In a similar manner, programmers can get called in to do some work that requires them to pull out weapons you may not have thought they had. I just realized today that the 5-10 minute delay in starting up of Eclipse matches exactly with a same spike in my internet usage! What the hell is going on here? I started noticing the delay in Eclipse after I installed the PyDev plugin. I haven’t really looked into the reason for the delay, and it might have nothing to do with PyDev, but that sure would be a hell of a coincidence. 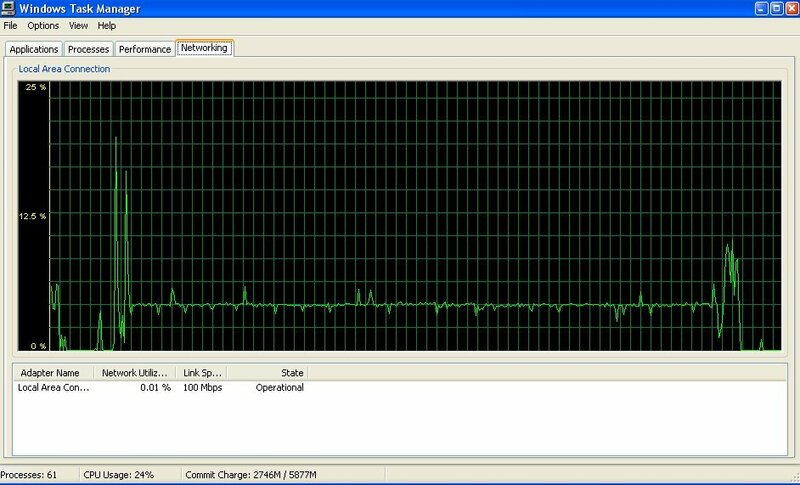 I wonder what data is being sent/received which causes this. I wonder if Eclipse is sending over keyboard shortcut usage statistics to the server – although I remember switching that feature off. 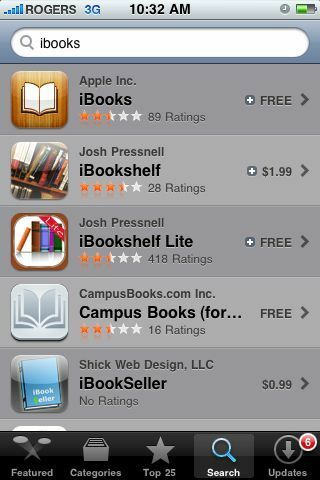 In the AppStore, some of the purchases have a plus sign next to them. 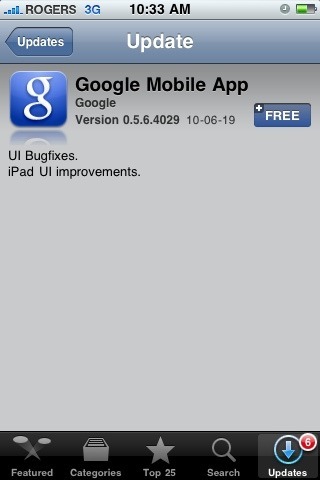 This indicates that the app has an iPad version too. Apart from the built-in spell-checker which underlines incorrect words with red squiggly lines, you can also select a word manually and in the pop-up that appears there will be an extra option called ‘Replace…’. 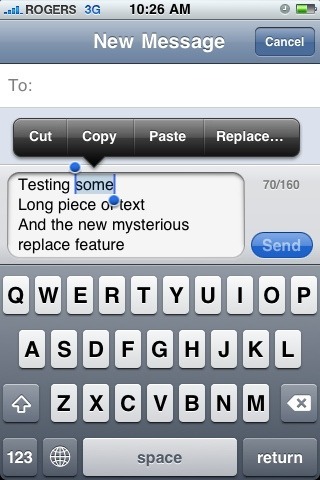 Tapping ‘Replace…’ brings up suggestions for other words that you might have intended to type instead of the original. I’ll add more if I find something else interesting. I had quite some trouble setting up Mercurial/Murky to work the way I wanted it to, so I’m writing it down here so I can reference it in the future if I ever need to and maybe it can helps others too. The default settings for Hg (Mercurial) don’t seem to be the most user-friendly. In particular I didn’t like the way the default pull/update/merge was working. Fortunately, you can tweak settings in Hg to make it work to your liking. You will need to edit the dot file .hgrc located in your home directory for this. In the [ui] section, I also included a username part. This ensures that when I push to Bitbucket, it links my push to my bitbucket account. Otherwise it will display the username and machine you are committing from as your username. Refer to the FAQ for more details. The version of Murky that I’m using (v0.8.1) doesn’t let you do a hg push if you checked out your repository through https. You can still do it through the command line, but that is annoying. So I suggest cloning your repository through the ssh url that bitbucket provides. This is a known issue and might be fixed in the future.